It's free , fast and easy! If you are looking for basic SSL then let's encrypt is the place to go It is very fast and easy. It's great because you can get a free wildcard and add as many sans as you want. Thank you so much!! Greatly appreciated!! After a long time on the Internet I found a 'Let's Encrypt' and 'SSLShoper' as a solution for the certification site that is effective, free and caring regarding maintenance certificate (notice of expiry of the certificate). So I put on my site banner that visitors know what they can use regardless of application of HTTPS protocol. Great opportunity, among other things, is a picturesque control which is made with 'SSL Checker' support. Compared to other expensive solution 'Let's Encrypt' is a real treasure. "O certifica da empresa comercial Moraes é uma farsa pela SSL." Esta empresa Comercial Moraes, comprei uma maquina com pedido :#21196, em 08/01/2018, e toda semana muda a data de entrega, e agora não tenho mais acesso a minha conta e ao pedido, eles não atende o telefone, não respondem e-mail, e aparece no SSP, como empresa confiavel. I save and dramatically improve time using let's encrypt I saw automation literally. So easy to use on my VPS for my web and mail servers. Lots of add-ons and automatic setup for various systems. In my case Wildcards are supported too. Can't thank them enough after all the messing around I've had from paid "Authorities" over the years. AND it's free.. unbelievable really so worth donating to support these guys. Thanks Let's Encrypt!! 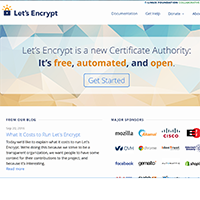 The free Let's Encrypt SSL certificate is perfect for most small or medium sized websites. These days it's easy to find a reliable hosting company that will install the certificate on your site with just one or two clicks. The certificate only lasts for 90 days, but you can set it up to renew automatically. Probably the only free authority that is actually good. I use it for pretty much all my sites that require ssl. They don't allow domains with a wildcard as subdomain though. I'll need this because I'll be working with lots of subdomains that are automatically changing, Let's Encrypt is probably the way to go even if you have a large website. Unless you want an oddly specific feature like I do.